Do you know how to improve quality and safety in manufacturing with automation and mobility? In the last article, we talked about quality control. Today we want to share with you how automation and mobility impacts manufacturing. When something has been the norm since the dawn of the industrial age, it is usually considered a bad idea to try to fix it. But with Quality Control in manufacturing, it’s long past the time to make big changes. 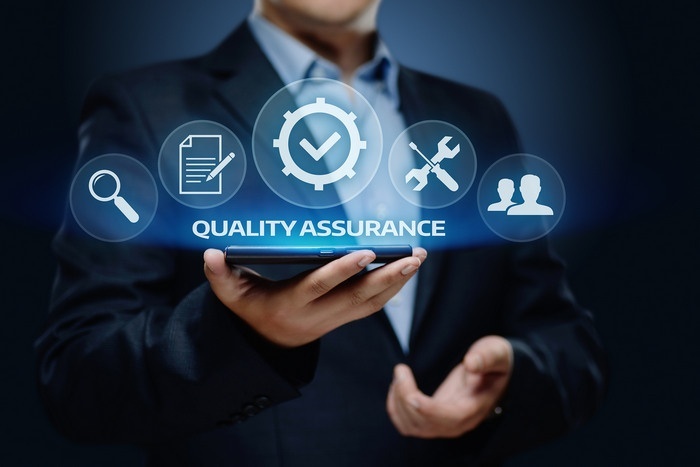 While research, design, testing, production, logistics and other areas of manufacturing have automated in leaps and bounds, quality control is still too often a very manual process that impacts both safety – and ironically – quality. The paper-based approach to QC means that information doesn’t travel. Data collected by someone working with paper and a clipboard in a faraway corner of a production floor won’t be available to other parts of the production floor or similar value stream in another facility. Not only is the data is not truly actionable, but the delays in decision-making that result are potentially costly due to waste and poor customer satisfaction. Paper and pencil (or even offline spreadsheets) mean a higher chance of error. All data recorded relies on the infallibility of the operator to be accurate. Even small error rates repeated over may facilities means a significant potential for loss and waste. The problem is also compounded over time, as manual reporting takes more time to emerge and present itself to decision-makers. The reporting itself is also subject to more errors, only compounding the problem as data is collated by hand and subject to human error as well. What the lack of real-time access, integrated reporting, and higher error rates lead to is a lack of visibility. Complex manufacturing operations comprised of multiple locations or diverse processes can’t achieve maximum productivity, performance or timely process improvements when management on the lines or in a central view is hampered and slowed by manual processes. Quality data collected, analyzed and reported on in a centralized, real-time manner has additional benefits beyond the decision-making and adjustment powers of management. When quality control data is accurate, organized and developed into actionable feedback, it also serves as a powerful training tool. Employees who are “in” on the data can see their relevant data which makes an impact on results and will likely be more intentional about being aware of potential problems or even just incremental improvements that are not always elicited from a spreadsheet. Untethered Devices - Utilizing devices which can be utilized where tasks are performed (i.e., a tablet, scanner, or other device carried on the person as opposed to a PC on a desk in a room far from the process area). Wireless Connectivity - Connected wirelessly and linked to a central collection point. This could be ERP or MES software, a data warehouse, or even a common transactional database on a central file in the cloud or that PC that is in the office. Power to Go – Having the ability to communicate wirelessly is one thing, but if the device lacks power (or enough power not to continuously require recharging), then it becomes its own source of inefficiency. Where some testing equipment is large and heavy enough to require a cart, this would mean a mobile power source. But what is the real difference for a business moving out of the 3-ring binder and clipboard approach to Quality Control? The two charts demonstrate the difference between automated Quality Management System and a manual system. 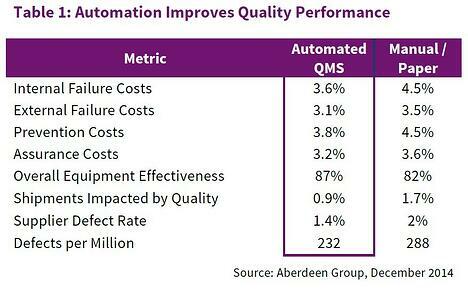 As the chart shows, every measure listed reflects measurable differences, ALL in favor of automated quality systems. Taken together and magnified over many thousands of cycles, multiple facilities and an extended period, you can see how the Manual manufacturer would put itself at a significant disadvantage to the automated one. Some of the KPIs here overlap with those in the “Automation” Table above. 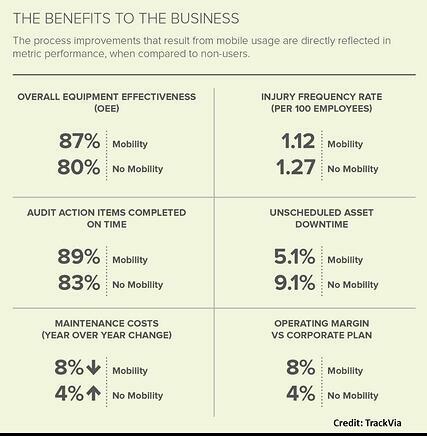 However, some additional KPIs that stand out and are worth noting include the “Injury Frequency Rate” as well as “Unscheduled Down Time” and “Maintenance Costs.” The real difference in the last metric is a full 12% when taken on a year-to-year basis with both systems starting at zero. Before jumping into the fray and committing to investing in new software, equipment, and training, there are a few steps worth spending time on before making that commitment. Document Your Processes – Software and equipment work best when they are designed to enable an existing process and improve it. The key to doing that is first to have an excellent grasp of what your existing processes are (Hint: Most manual-driven facilities DON’T). The document, map and validate the process you want to automate and then you will be a better client to whomever you are briefing to help you. Get Some Expertise – If you are a small or medium-sized manufacturer, you are less likely to have an in-house resource with the expertise to conduct the process analytics and documentation. Bringing in an outside resource – a consultant who knows the automation or mobility space would be a good place to invest first. Create a Culture of Listening – if you don’t already do this, you should. “Gemba” walks, along with doing some intentional and structured listening to the floor staff to get their perspective will make it easier for you to execute this initial process and benefit from it long-term as well. Finally, “Automation” and “Mobility” can be excellent objectives, but there is no need to commit to doing it all at once. Look at your business by process area. Those where you find the most manual labor or require the most people-hours (relative to other areas with more machines or some automation) are usually a good place to start. Many software products are modular, and equipment is designed or configured to the specific process, so you should be able to start small and roll out as you accomplish each set of successes. A good example of using technology and being more mobile is our new Atlas Series Mobile Dimensioning Stations.TM This award-winning new technology can scan any package in any orientation, and even takes a photo of every item for tracking and claim protection.